Stress management can be dealt with in a variety of ways. Personally, I use several approaches to stress management. When I consistently engage even one approach… I find that I am able to manage tension and worry in a healthy fashion. Stress is our response to things that pose a particular threat to our well-being. Today, many of us find ourselves dealing with different levels of anxiety on a daily basis. A little stress now and then is a good way to get the motor running. However, long-term stress even in small amounts... can have adverse effects on your well-being, as well as your health. Financial, job, and family stressors are quite common. Even so, there is only so much you can take before it begins to wear you down. Often stressors simply cannot be avoided. Thankfully, you can use a variety of stress management strategies for responding in as healthy a way as possible. In order to properly recognize stress and handle it fittingly, you must learn to recognize your stressors. By identifying your most common tension triggers, you will be able to react differently when tense situations arise. As an example, if you are on a tight budget …like many people today, you may go into panic mode every time a bill arrives in the mail. There may not be anything you can do to immediately remedy your financial situation. However, you can begin your stress management by recognizing that your worry seems heightened when a bill comes in. Like me, you may also find that you become overly anxious and stressed when you are stuck in traffic. Maybe you are late for work, and simply cannot afford to be late again. Now, if you get stressed every single day when you are in traffic, you’ll begin to experience some emotional and physical concerns. In the long run, this can actually lead you to missing time from work altogether. How Do I Know When I am Stressed? 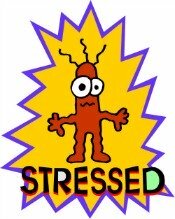 In today's uncertain world, we commonly say… "I'm so stressed!" Some people are quite vocal about their causes of stress. Others simply go through the day quietly feeling tense and worried. Many times they are not aware of their causes of stress and resulting symptons. Look for stress symptoms such as sleeplessness, lack of appetite, and stomach pains. Another sign is irritability…which often means that you are dealing with severe stress. You are overtired and no longer functioning in a healthy way. In today's busy and uncertain world, it is completely natural to feel overwhelmed from time to time. The problem is… when you are are stressed, your overall health and well-being are compromised. This can lead to poor performance at work, trouble in relationships, and health problems. By practicing a few simple stress reducing techniques and taking life day by day… you can greatly reduce your stress levels and truly begin enjoying life again.